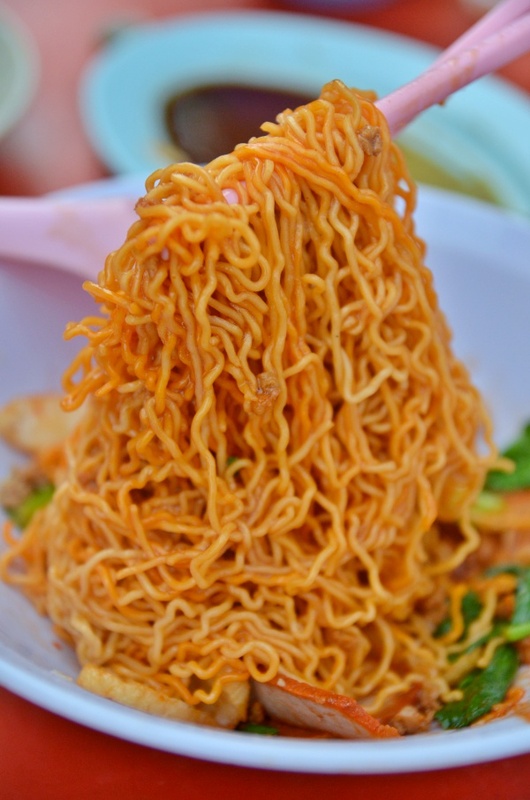 Sarawak Kolo Mee – Coated in a bright orange/red-coloured sauce; which is actually the oil dripping from the Roast Pork (Char Siew); this is a sinful yet fabulous way to enhance the flavour of the noodles. It pains me to write that first line up there. Yes, this is my last weekend in KL and Malaysia, before moving to Singapore next weekend. Hence, you can imagine the turmoil surrounding me at this moment. I am sorry if the recent reviews lacked depth or food shots; since I barely have time to park myself in front of the computer and get in the mood for writing. Time factor aside, the scarily congested roads after work due to Ramadan, unfinished business and fickle weather, compounded by the never ending urge to complete my ‘makan list’ before making a fresh start down south are debilitating to say the least. I won’t bore you with the melodramatic outbursts. Let’s focus on relishing each and every minute of your Sunday with your loved ones or calm the nerves and recharge the soul by your own self after a turbulent week at work. 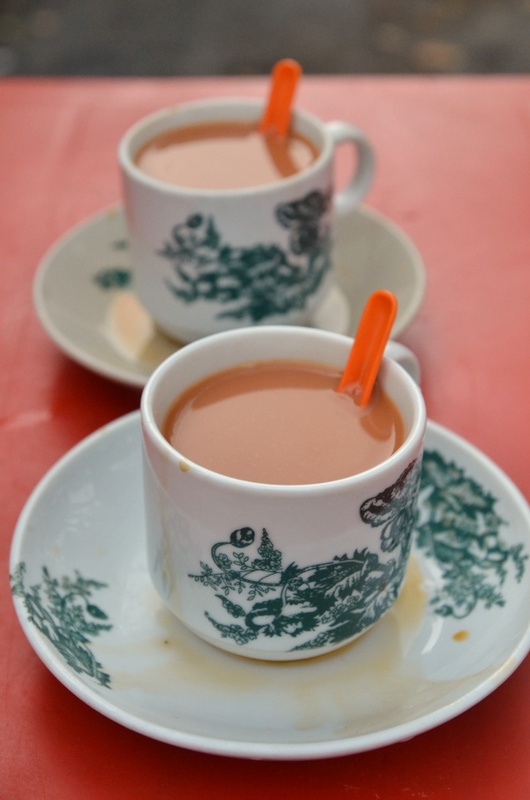 The comforting sight, scent and taste of freshly-prepared milk tea from traditional kopitiams is a blessing; especially on a Sunday morning. 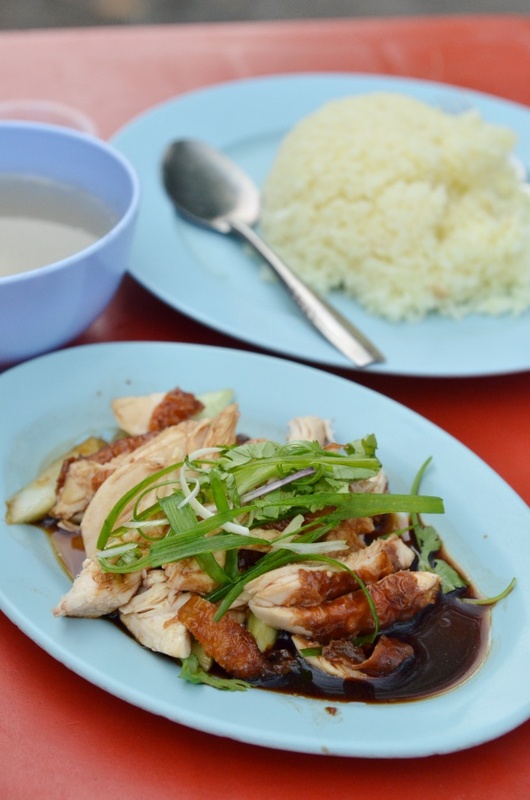 Hainanese Chicken Rice (MYR5.50/USD1.70) from this stall at Kedai Kopi Nam Chun (or Nam Chuan) in Lucky Garden is quite a delightful affair. And a fair price to pay in the heart of Bangsar. 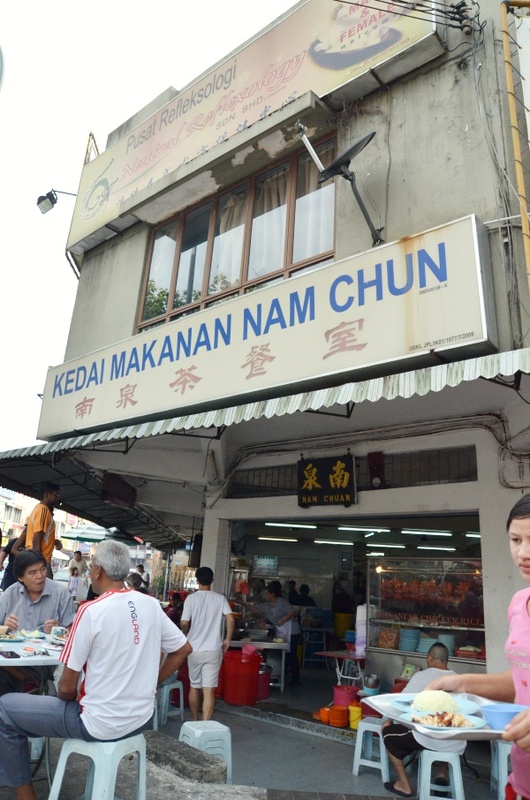 I first visited Nam Chuan Coffee Shop way back in 2008; during my first year of writing. Of course, the corner coffee shop in Lucky Garden is famed for Aunt Christina’s Sarawak Laksa, which is still arguably the most famous version in all of Klang Valley. Some may beg to differ but her version was the closest to the ones I had in Kuching. 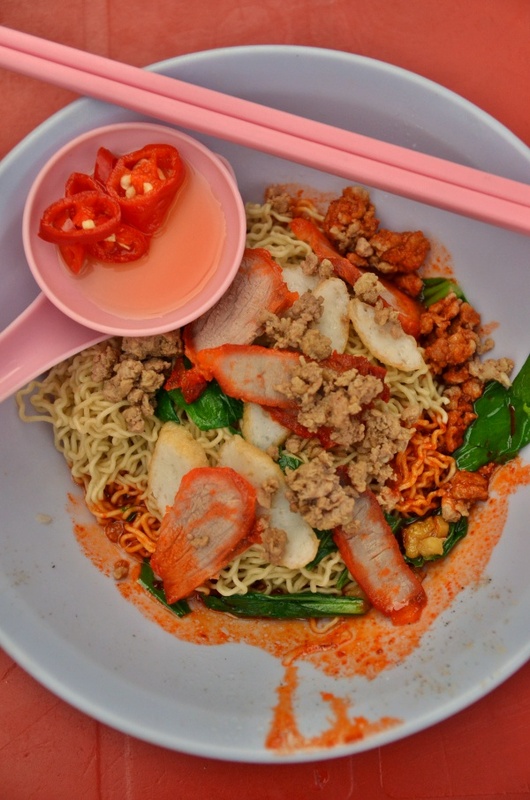 Served with slices of lean Char Siew (BBQ pork), fish cakes, minced pork, lard fritters, ‘choy sum’ (sawi/mustard greens) and drenched ceremoniously in a fearsome red sauce; the Kolo Mee here deserves a thumb’s up. At MYR5.00/USD1.60 per serving. This morning, I decided to go with the Sarawak Kolo Mee instead; parked behind of the prominent Aunt Christina’s Sarawak Laksa stall. Many a times, I have been let down by self-declared “Sarawak” Kolo Mee stalls in KL/PJ; routinely ended up with meagre affairs whipped up by foreign workers without a care for quality or customer’s satisfaction. But this stall at Nam Chuan stirred my interest from the get-go. Why? Because of the availability of having your Kolo Mee either plain OR with the optional splash of red sauce collected from roasting the Char Siew; i.e. pork lard oil tainted with the red colour from the Char Siew dye. Sounds scary on paper but the sweet-savoury taste lent the noodles a certain dimension not possible with the conventional combination of soy sauce, dark soy sauce or a dash of sesame/shallot oil. The springy noodles had that characteristic crunch of good Kolo Mee from Sarawak, and very minimal alkaline taste from lye water (‘kan sui’). The ingredients that went into the bowl were merely passable though; the sliced Char Siew being the routine lean meat version, the fish cakes were generic and the minced meat tasted just fine. *On a side note, though I don’t have any photos to show, the best Kolo Mee I have had thus far was in Kuching; at a pretty rundown shop named Sin Lian Shin that’s a firm favourite with the locals apparently. The old couple (based on my assumption) selling fresh and fried popiah at the side of Nam Chuan Coffee Shop; at MYR2.00/USD0.60 per roll. The Hainanese chicken rice stall was drawing in the crowd that early in the morning (was about 9.30 am), hence we succumbed to temptation and chose to skip lunch later probably. The roasted chicken, oil rice and white radish, peppery soup with a side dipping of piquant, tangy chilli sauce was satisfactory; yet still not as good as Section 17’s Hong Seng in my opinion. Finishing up the first meal of the day with take-aways of two spring rolls aka ‘popiah’ from the stall on the outside of the shop. 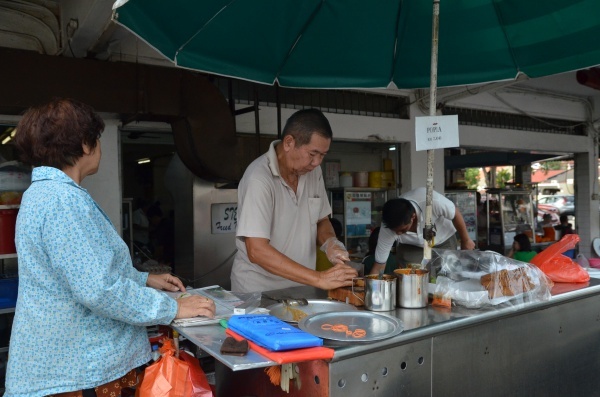 The elderly couple running the stall were pretty down to earth people; the uncle probably in his 60’s was well in his elements – swiftly wrapping up the fresh popiah on the spot while sheepishly answered to my incessant queries. Call it a bad habit of mine. 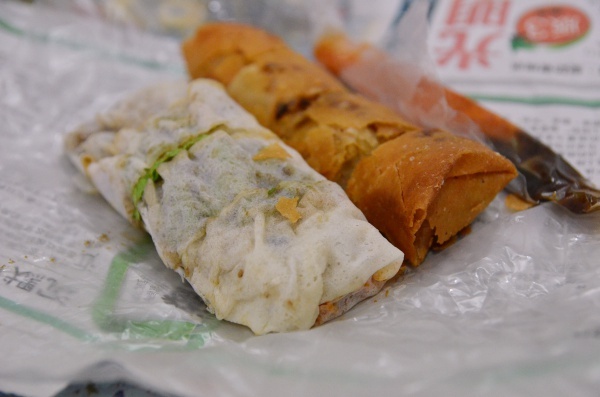 The popiah was filled with juicy cuts of yam bean cooked in a savoury broth; then he tossed in a few shreds of fresh lettuce and boiled bean sprouts, and a handful of fried shallots for flavour. The deep fried version was just as good, though the rolls appeared smaller than the conventional ones. A perfect start to a Sunday morning should be a hearty breakfast; coupled with a cup of really good coffee or tea, and lots of natural sun to perk the mood up. At Nam Chuan Coffee Shop, you get to observe the gleeful camaraderie of the neighbourhood folks engaging in small talks (of how Netherlands narrowly beat Costa Rica the night before), older folks reading the dailies and shaking their heads in disbelief (seriously … I read them with a pinch of salt, every single day), expats walking their dogs and stopping over for a taste of local hawker delights, and food lovers like yours truly brandishing a DSLR to peculiar stares. All the best in your future endeavours Motormouth! Please don’t pick up the kiasu habits ok! Cheers!